As the rubbish we create all over the world piles ever higher, the question of how to cut down on waste has become a global issue. Businesses around the world are struggling to create less waste, but government legislation is at last kicking in and, hopefully, making it essential for everyone to get on board, or pay a penalty. So, with the rules tightening, hospitality providers are desperate for ways to be more sustainable; to use products that can be recycled. By doing this, they not only tick the boxes in terms of legislation, but also save money on their precious budget. It’s great for attracting customers too as a commitment to reducing your carbon footprint can earn valuable brownie points with customers who are increasingly interested in giving their hard-earned cash only to those businesses that have made a strong commitment to sustainability and reducing waste. For example, branded bottled drinking water is a commodity that has the potential for huge negative environmental impact. Hotels, restaurants, bars and pubs do good business selling branded bottled mineral water. The glass and plastic waste from these bottles is significant, and can have a negative impact not only on the environment, but also the business’s bottom line, as this article will discuss. One company that is offering a real and very cost effective solution to bottled waste is Vero Water, and their focus on limiting waste, and other environmentally friendly practices, really sets it apart from all its competitors. 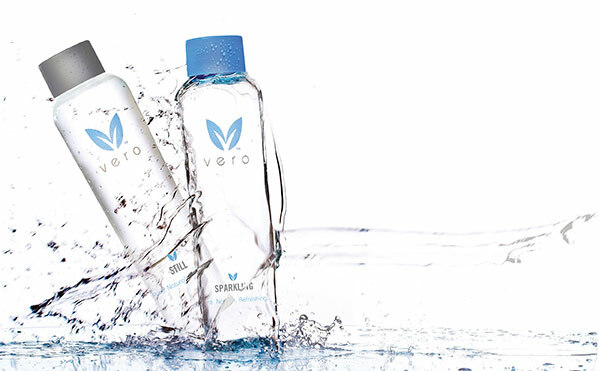 Vero Water has developed a range of unique water purification and water bottling systems that are the perfect alternative to traditional bought-in bottled water, enabling hotels to offer customers purified, chilled and great-tasting still and sparkling water very inexpensively, with zero waste. Vero systems simply connect to the existing mains water, and at the press of a pre-set button can fill a glass, or a 950ml Vero-branded glass bottle. Mindful that presentation, style and brand appeal are essential in the hotel business, these bottles are attractive enough to grace the tables, or rooms, of even the finest hotels around the world. But their real beauty is that they have been specially designed to be reused and are durable enough to withstand daily washing in a standard hotel glass washer. The upshot of all this is massive environmental benefit, as not only does it create a practically zero carbon footprint, but it helps to keep landfills free of one-use glass and plastic waste. There is also the issue of how importing branded bottled water can impact on a hospitality business, and this is another area where Vero Water systems have huge appeal. Vero Water MD, Ian Baragwanath, says: “People are becoming increasingly conscious of not only their own carbon footprint, but the carbon footprint of the places they visit, the restaurants, pubs, bars and hotels where they like to eat, drink and stay. People are voting with their feet and choosing hospitality venues that are as eco-friendly as they are. Vero Water’s bottled water systems are the perfect choice for forward-thinking estab-lishments who want to develop and maintain a strong eco-friendly initiative. Going green can also increase revenue. The overall, positive knock-on effect on hospitality businesses is significant. Reusable bottles help reduce stock, transport and delivery fees are non-existent, fridge and storeroom space is freed up and waste is kept to a minimum. Plus of course the reduced man hours spent restocking and reordering…the list is endless. This is an all-round solution that benefits everyone…win-win, and no waste! Providing only the best quality products is, of course, something most establishments are very focused on, and this is view shared by Vero Water. Ian Baragwanath says: “Some water tastes better than others, and the difference is simply the treatment process the water goes through. Water coming from a tap, a bottle or some filtration system can make all the difference between a taste that’s crisp and refreshing, or just plain ordinary. “The quality and taste of the water from Vero Water systems is second to none, and this is achieved by our unique five-step water purification process, which removes impurities, chemicals and imperfections in the water. “The result is a taste that is noticeably more palatable than ordinary filtered alternatives. Once purified, the water is flash chilled, if required, and our systems can serve it either still or sparkling. So, is this the future for water in the hospitality industry? It is certainly a compelling solution, and one that ticks all those boxes we mentioned earlier…zero carbon footprint, zero waste, increased profits, and of course a healthy boost to customer satisfaction. Now that’s something every business can relate to! For a limited time only, Vero is offering easy monthly payments, with nothing to pay for the first 3 months. And if you’re responsible for making the food and beverage buying decisions, we’ll pay you £50 for a meeting, show you how much profit you could make and tailor a bespoke package for you. If you’re not the decision maker, just provide the details of the person responsible over the phone and we’ll reward you too. There’s no tricks or gimmicks, just affordable, premium and unlimited chilled, ambient and sparkling water at the touch of a button.